This is the second review in a series on Minolta's manual focus normal lenses, to see the first in the series, click here. When investing in a Minolta manual focus system one of the first lenses commonly purchased is a 50mm f/1.4 lens. The reason for this is that it is fast, sharp, and with brilliant contrast, while at around $50 it is about a quarter of the price you might expect to pay for the faster f/1.2 lens. April 1973 - Introduction of the 50mm f/1.4 MC Rokkor-PG. The lens used the same optical formula as the 58mm f/1.2 and weighed in at a more reasonable 305g compared to the f/1.2's 478g. It has outstanding build quality, and with its big (but not bulky) design it is an absolute pleasure to use. August 1977 - Minolta introduced the 50mm f/1.4 MD Rokkor-X. It was the first wholly new lens designed for the MD system, and while it retained the 7 element, 5 group optical construction of the MC lens it was a more compact design, slightly shorter and 60g lighter at 245g. June 1981 - The existing 50mm f/1.4 lens was updated to a late MD cosmetic design (aperture ring lock, focus scale in orange not green etc.). The lens weighed an extra 15g at 235g, but otherwise was unchanged from the MD Rokkor-X version introduced in April 1979. 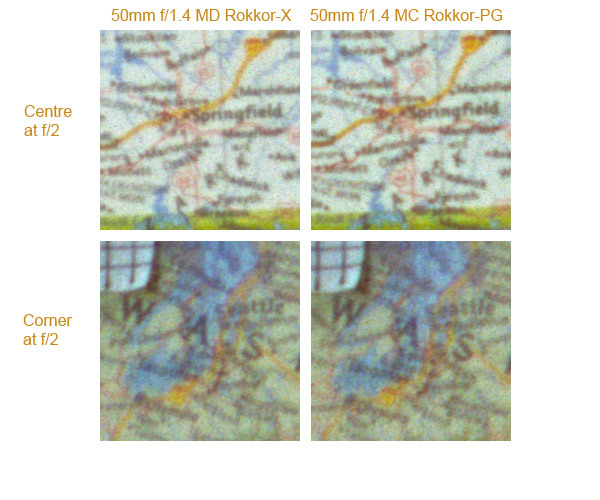 The lenses being evaluated in this test are examples of the first two incarnations, being the 50mm f/1.4 MC Rokkor-PG and the 50mm f/1.4 MD Rokkor-X (both with 55mm filter threads). An example of the later design was unavailable for the test, but I have previously tested the 50mm f/1.4 MD and at that time I found it to be inferior to the MC version. This finding was in line with the opinions of several other collectors and testers, and accordingly I believe there is a consensus that the earlier designs are better performers in terms of resolution. An important consideration to remember with these tests is that they should be treated as a guide only, and a general source of information. This is because only one sample of each lens was tested in this review, and there is no way for me to tell if the sample tested was indicative of the average performance of the entire production run. Your 50mm may perform better or worse than the ones shown here, so if this is important to you, you should consider testing your lens yourself to ensure ultimate sharpness. All tests were performed on a focus calibrated X-570, using a viewfinder magnifier and a tripod, and Fuji Velvia 100F fine grained slide film. The camera's self timer was used to combat vibration. Slides taken have been scanned at 5400dpi, and focus has been individually set for each crop so as to avoid any issues with film flatness. Digital ICE and grain management has been turned off to obtain maximum possible resolution. The 50mm f/1.4 MC Rokkor-PG is one of my favourite Minolta lenses, and battles it out with my 50mm f/1.2 MD Rokkor-X for time on my camera. We have already seen how the 50mm f/1.2 performed, so I am interested to see how it compares with the MC f/1.4. Whatever happens, one is going to be getting the lion's share of time on the camera in future. 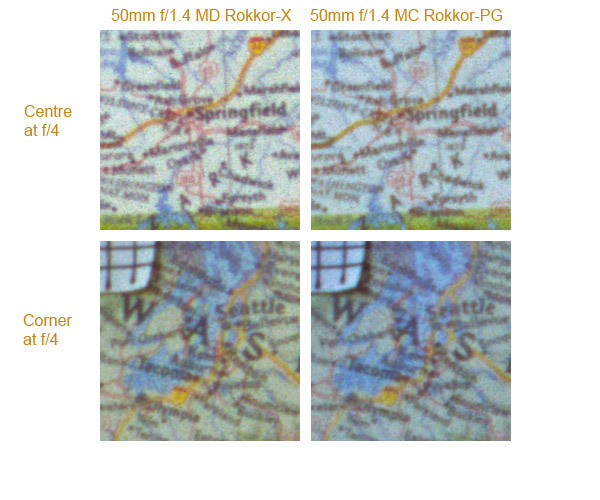 I am particularly interested in evaluating the bokeh of the 50mm f/1.4 MC Rokkor-PG. We saw in the f/1.2 test that the 58mm lens, while not as quite as sharp as the 50mm f/1.2, had much more pleasing bokeh. With the same lens design it will be intriguing to see if the 50mm f/1.4 lenses maintain that superb out of focus rendition. Anyway, enough preliminary discussion, and let's get down to business! Above we can see the performance of the two lenses from centre and corner crops at f/1.4. Results show excellent detail given that the lenses are wide open, certainly considerably more detail than that achieved in our last test with the f/1.2 lenses. Contrast is also noticably improved from the level recorded with the faster lenses. It is noted that this is a challenging test target (not particularly high contrast) and that this crop reflects an area of less than 1mm square on the original negative. 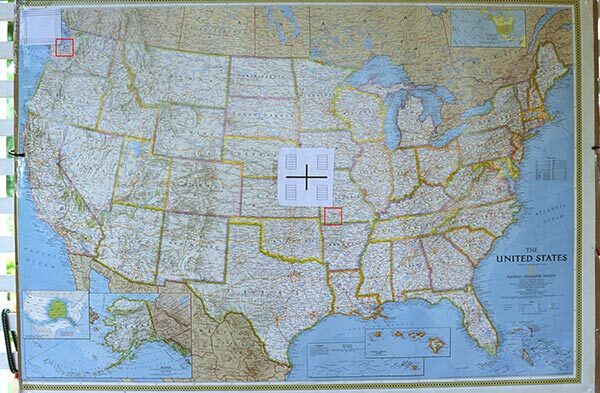 At the screen resolution above (at standard 72dpi) the equivalent print size would be 6 feet by 9 feet. Given this the performance wide open of both of these lenses is very impressive. Based upon my review of the images from which these crops were taken I conclude that at f/1.4 the 50mm MC is noticably sharper than the MD in the centre, but that the gap between the lenses has narrowed at the corners and both are very similar at this point. Corner performance is actually very impressive, and contrast remains good, despite light falloff (discussed later). It is my opinion, based upon the above results, that both lenses are fully useable even for work requiring relatively fine detail at f/1.4. This is an outstanding result and a tribute to the quality of the 30 year old design. 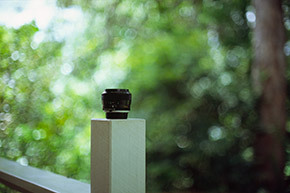 The shot below was taken with the 50mm f/1.4 MC Rokkor-PG at f/1.4 in order to minimise the depth of field. The bokeh exhibited in this shot is gorgeous, and it is quite probably my favourite shot taken in 2004. Owning a 50mm that is sharp enough to generate these results at f/1.4 opens up some amazing photographic possibilities. Low light photography can be fully explored, and the use of wider apertures to deliberately reduce the depth of field can be undertaken with confidence. At f/2 the MD lens has improved markedly to catch up to and even possibly surpass the MC version. The MC lens has naturally also improved, and in fact both lenses deliver excellent resolution at f/2. The double lines of some of the highways are visible in the crops from both lenses, but possibly slightly more clearly in the MD version.. 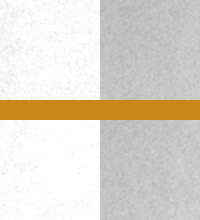 When you consider that these lines are approximately 0.5mm apart on the original poster that is a quite incredible result. The corner sharpness of the two lenses appears to be very similar at f/2. Overall, I feel that at f/2 the MD lens has very fractionally outperformed the MC lens, but the difference between the two lenses is very difficult to pick even at a 100% crop at 5400 dpi. Certainly there would be no way to split the two lenses based upon prints, even with very big enlargements. At f/4 the MD version holds its marginal lead in centre sharpness, and corners remain too close to call. Contrast has also improved with both lenses. These are amazing optics. At f/8 the 50mm f/1.4 MC Rokkor-PG has caught up to and possibly marginally surpassed the 50mm f/1.4 MD Rokkor-X in terms of centre resolution. Both lenses record excellent corner sharpness. This is the best aperture tested in terms of sharpness for both lenses, but the difference between the results at f/4 and f/8 is very small. Certainly either of these lenses could be used for images where critical sharpness was a priority from f/4 and above. Based upon the crops above and my reviews of the full images I conclude that the two lenses are very similar in terms of performance, and are difficult to differentiate between. Possibly the MC was the better performer at f/1.4, but at f/2 and f/4 the MD marginally outclasssed its earlier counterpart. By f/8 the MC was once again slightly better. I believe that the performance of both was so close as to render it impossible to say that one was better than the other. Lets examine some other aspects of the lens' performance to determine if these will help us separate them in terms of performance. To test each lens in their rendition of bokeh I set up a challenging target with lots of distracting highlights in the rear. Note, this is an extreme bokeh test! The lenses were tested wide open at f/1.4, and again at f/4, what I would consider to be a normal portrait aperture when photographing in daylight. The 50mm f/1.4 MD Rokkor-X shows neutral bokeh and the areas without sharp highlights do show a very nice blur. The 50mm f/1.4 MC Rokkor-PG shows results possibly not quite as good as those achieved by the MD version, but still OK. The background blur of the 50mm f/1.4 MD Rokkor-X is not bad, but it is not up to the level of either of the f/1.2 lenses (as would be expected). The 50mm f/1.4 MC Rokkor-PG surprisingly performed slightly poorer than the MD version at this test, albeit the differences were very minor.. Both lenses show some evidence of this ring, but clearly the 50mm f/1.4 MD Rokkor-X has slightly better performance in this respect. It should be noted that the test above is an extreme one with literally hundreds of highlight spots, and huge transitions in contrast. Normal use would see a much nicer blur. At f/4 the area out of focus is of course better defined, and you might expect that the bokeh rendition of the lenses will be much closer. Let's examine the shots and see. At f/4 with the MD the background highlights have blurred together nicely. 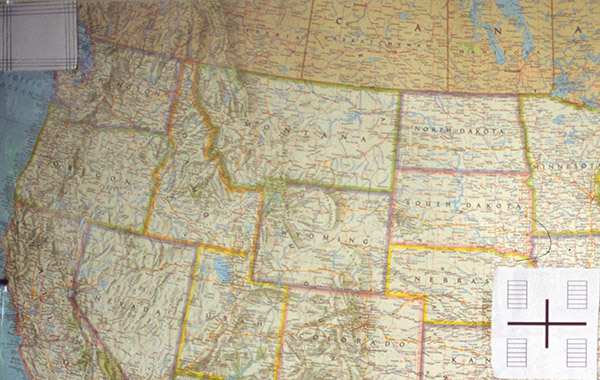 The hexagon shapes of the MC's highlights are slightly more defined, but the blur is still very nice. The bokeh of both lenses appears good, but the 50mm f/1.4 MD Rokkor-X still definitely has an advantage. The highlights show slightly less definition, providing a marginally smoother background in areas of very high pinpoint highlights. Based upon my review I would expect either lens to perform well in terms of out of focus blur in normal use, with the MD lens possibly marginally edging out the MC (albeit the differences are quite minor). 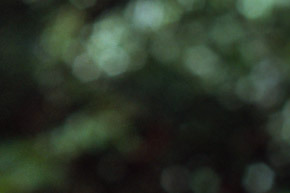 The images above are designed to show a lens' flaws, and as a result you may conclude that these lenses are poorer performers with respect to bokeh. Disabuse yourself of this notion, as it is patently not the case. 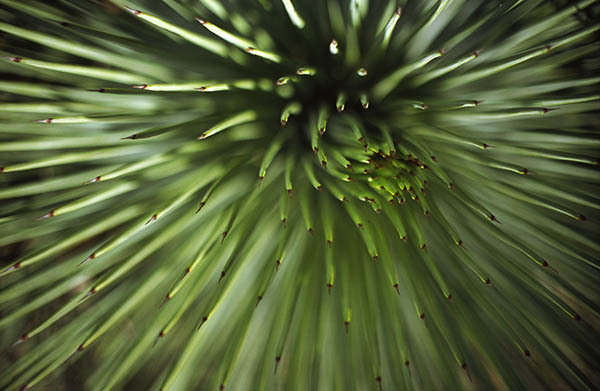 A quick review of the photograph shown previously of the plant demonstrates that the MC lens has outstanding out of focus rendition, and based upon our tests the performance of the MD would even be slightly better. Either of these lenses would make an outstanding performer when it comes to bokeh, but certainly still the 58mm f/1.2 reigns supreme. One of the issues when shooting with faster lenses is the natural light falloff that occures at the extremities of the frame when shooting at, or close to wide open. Most visible when taking photos of regularly toned subjects, like landscapes with blue skies or light coloured walls etc, it manifests as a darkening of the frame at the corners. If you shoot with negative film this may not be an issue for you, as it can often be addressed in the printing process. However with slide film a drop of a stop or so in the corners may cause them to be irretrievably darkened, and can ruin a good slide. Virtually all lenses exhibit a degree of light falloff at wide apertures, and the real sign of a lens that handles this well is when this falloff is gone after closing down a stop or two. Lets see how the two Minolta 50mm f/1.4 lenses handle falloff. Methodology for this test is as follows. The test target includes an area of white at both the centre and the extreme top left corner. 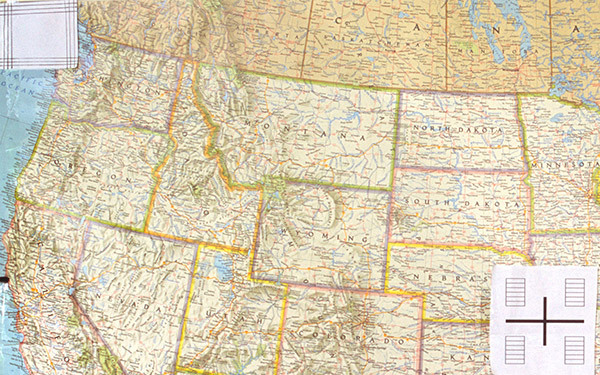 The centre area is selected and adjusted in photoshop to be the white point for the image. 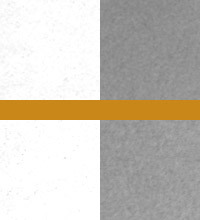 A crop is taken from this area, together with a crop from the corner, and the resulting crops are desaturated, and placed side by side below. The image to the right shows two sets of crops. The top two are from the 50mm MD at f/1.4, the bottom two from the 50mm MC at f/1.4. 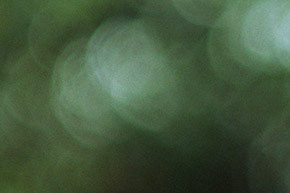 As can be seen, both lenses exhibit significant falloff at f/1.4 when using slide film. As discussed above, this falloff will be less noticeable, but still apparent when using negative film. 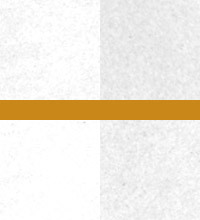 When seen side by side the falloff seems particularly significant, but when seen in terms of the full image it is lessened to a degree by the distance between the crops. 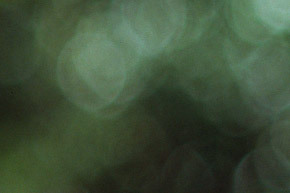 For example, refer to the crop below of the full image from the 58mm f/1.4. At f/2 both lenses record a significant improvement in falloff. At this level the falloff would likely be not noticeable in a photograph unless the shot included a significant expanse of solid colour, such as a blue sky. I can see no real difference between the performance of both lenses. At f/4 the falloff is virtually eliminated on both lenses, and would not be noticed when shooting a broad expanse of a solid colour, even on slide film. Refer to the image below showing the sample area at f/4, and it can be clearly seen that for all intents and purposes falloff is eliminated at f/4. As is evident above, the slight difference in the white crops seen when they are side by side is simply not visible when looking at a full image taken at f/4. Both lenses record significant falloff at f/1.4 that would be apparent on prints or slides. By f/2 this falloff has been significantly reduced, and by f/4 it is all but gone. Based upon the results detailed above I conclude that both lenses are essentially identical in their performance in this respect. The two 50mm f/1.4 lenses tested are outstanding optics, and performed brilliantly for what are still very fast lenses. Central and corner sharpness were outstanding from both lenses, and perfectly usable for full frame critical sharpness applications from f/4. For portraiture and general use these lenses can be used wide open at f/1.4 without hesitation, bearing in mind of course the light falloff that is evident at larger apertures. The performance of both lenses was superior wide open than that recorded by the f/1.2 lenses at f/2, and in fact across the board, at all apertures the f/1.4 lenses outperformed the f/1.2 lenses in terms of resolution and contrast. In terms of bokeh the 50mm f/1.4 MD Rokkor-X performed marginally better in our tests, but I would question whether anyone would be able to pick the difference in a photograph, even at larger print sizes. 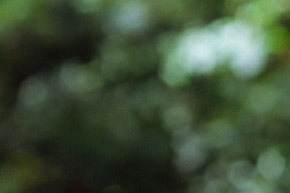 In general use both lenses produce a lovely blurred out of focus rendition, enabling the photographer to concentrate the viewer's attention on his subject. Overall I rate the 50mm f/1.4 MC Rokkor-PG and the 50mm f/1.4 MD Rokkor-X as equally as good as each other. The MC had a very slight resolution advantage at f/1.4 in our test, and the MD had very slightly better bokeh in our examination of this aspect of lens performance. These differences are, however, so minor that they could simply reflect sample variation, and accordingly I would consider that the owner of either of these lenses has every reason to be pleased, and no reason to covet the other version. A useful test would have been to also consider the 58mm f/1.4 MC Rokkor. Produced prior to April 1973, the 58mm f/1.4 has an avid following who swear by its performance. It is made from six elements in 5 groups (similar to the later 50mm f/1.7 lenses). I find it difficult to imagine that its resolution would be up to that of the later 50mms, and certainly it strikes me that Minolta would have been unlikely to produce a more expensive 7 element design to replace it unless this also brought with it improved performance. Well there it is, my review of the f/1.4 normal lenses. Still to come are the reviews of the slower normal lenses, comprising the 50mm f/1.7, f/2 and the 45mm f/2. I am intrigued to discover if there will be a hidden gem amongst these cheap lenses.